An early start this morning as we did an assembly for 200 pupils this morning. They were a really friendly bunch and Bob and Jude left Danny and Laura to make bat boxes with 20 children. Some of the boxes will go up at the school and the remainder into local parks. 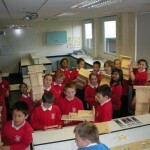 This was another event in our Bedford Bat Box project funded by Bedford Borough Council. That’s over 400 people we have talked to in Bedford in just over a month. This entry was posted in Uncategorized and tagged Bedford, boxes. Bookmark the permalink.